Dart Class catamaran, Falmouth, Cornwall. A typical ‘minor’ yet very meaningful commission. Kim Stephens of Panther Craft was a very likable friend, was partly responsible for the development of the highly successful, innovative Dart catamaran. Kim had been talking on and off to Gordon about a commission. Very sadly he died far too young. This picture was commissioned by his widow. 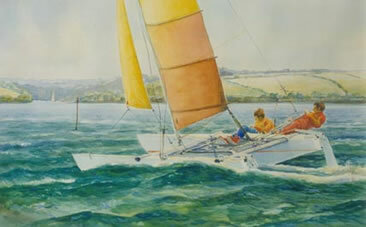 The painting shows him with his son sailing on his favourite stretch of home water off the entrance to Restronguet Creek, Falmouth, Cornwall.